Data source International Pharmaceutical Abstracts, PsycINFO, Medline, Embase, Cochrane Central Register of Clinical Trials (CENTRAL), CINAHL, and LILACS. Analgesic and adjuvant pain drugs are often prescribed for patients with sciatica.8 Patients with a clinical diagnosis of sciatica are about five times more likely to take drugs than those with low back pain only.4 Drugs commonly prescribed for the management of sciatica include non-steroidal anti-inflammatory drugs (NSAIDs), skeletal muscle relaxants, opioid analgesics, benzodiazepines, systemic corticosteroids, antidepressants, and anticonvulsants.9 10 While guidelines provide clear and generally consistent recommendations for the prescription of drugs for non-specific low back pain,11 12 this is not the case for sciatica. At present the efficacy and tolerability of commonly prescribed analgesic and adjuvant drugs for the management of patients with sciatica has not been established. The problem is that there are no reviews that specifically focus on these drugs that are used in primary care to manage sciatica. Because most guidelines recommend a course of conservative care before surgery is considered, it is imperative to understand what best practice conservative care should entail. In this systematic review we determined the efficacy and tolerability of analgesic and adjuvant pain drugs typically administered in primary care (orally, topically, or parentally) in the management of patients with sciatica when compared with other treatment options or no treatment. We used the review methods advocated by the editorial board of the Cochrane Back Review Group.13 This study searched the following databases from the earliest records to 15 March 2010: International Pharmaceutical Abstracts, PsycINFO, Medline, Embase, Cochrane Central Register of Clinical Trials, CINAHL, and LILACS. Key words related to randomised controlled trial, sciatica, and drugs terms in addition to subject subheadings and word truncations specific for each database were used (see appendix on bmj.com). 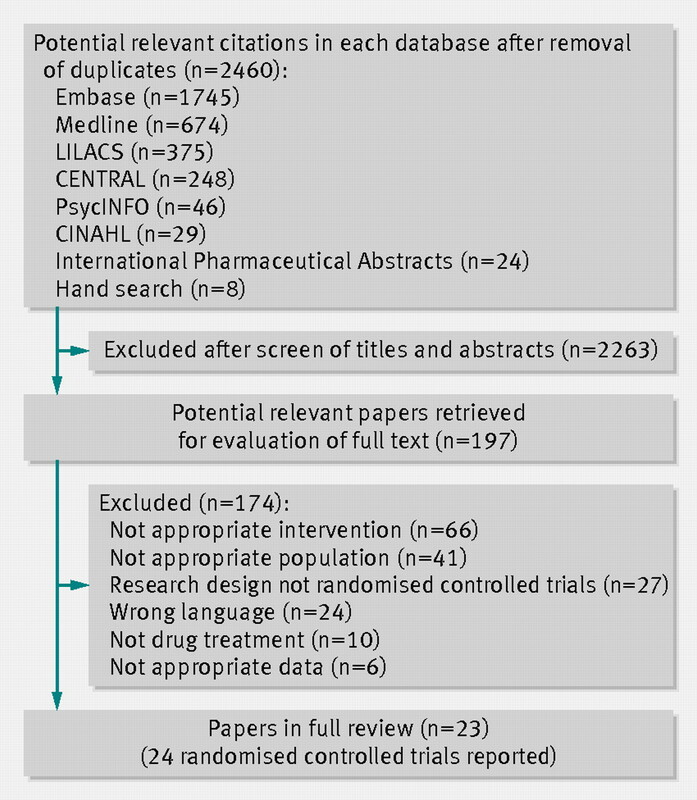 Electronic searches were supplemented by hand searching reference lists of eligible clinical trials. Our search was restricted to trials published in English, German, Dutch, Portuguese, and Spanish. One reviewer screened all relevant titles and abstracts and excluded clearly irrelevant papers, leaving 173 potentially relevant papers. Two reviewers independently evaluated the full reports for eligibility. Disagreements were resolved by discussion. Studies were eligible if they were randomised controlled trials evaluating single or any combination of analgesic or adjuvant pain drugs. For the purposes of this review, we focused on pharmacological interventions that could be administered in primary care settings, which include drugs administered via oral, topical, or parental route (that is, intramuscular injection and intravenous bolus). We excluded trials evaluating procedures that require imaging assistance and the monitoring of anaesthesia monitoring capabilities (for example, epidural, extradural, and intradiscal injections) or that require an extended period of time to be administered with monitoring of the patient’s vital signs (for example, intravenous infusion). Eligible comparisons included no treatment, placebo, or other treatment options (for example, other pharmacological treatment, surgery, epidural injections, or other conservative treatment). To be eligible studies needed to explicitly report that participants had sciatica or a synonym for sciatica. Sciatica synonyms considered included radiculopathy, nerve root compromise, nerve root compression, lumbosacral radicular syndrome, nerve root pain, nerve root entrapment, and pain radiating below the knee. The intensity or duration of symptoms was not restricted, but participants were classified as having acute (less than six weeks), subacute (six to 12 weeks), or chronic (12 weeks or more) symptoms. Trials of mixed groups of patients with low back pain were eligible if it was possible to clearly identify a subgroup with sciatica and data only from these participants were included in the analysis. There was no restriction related to the source of participants. Sciatica definitions across trials were classified as those based on clinical assessment alone and those that also require concordant imaging evidence. Trial drugs were classified according to the Anatomical Therapeutic Chemical (ATC) classification system advocated by the World Health Organization’s collaborating centre for drugs statistics methodology.14 Table 1 lists the classes of drugs and the ATC codes included in the search strategy of the original protocol⇓. Trials were included when one of the following outcome measures was reported: overall pain intensity (when not specified as leg or back pain), leg or back pain intensity, disability status, work status, and adverse events. We also included studies that did not report continuous data for these variables but reported percentage of improved patients. As the definition of improved (or not improved) was unclear or varied between studies, however, we did not pool these data. Work status, when identified, was listed as an outcome but pooling of these data was also not possible because of different definitions used across trials. Two trained independent raters assessed the quality of the trials’ methods using the PEDro scale.15 16 Disagreements were resolved by a third rater. Methodological quality was not an inclusion criterion. Two independent reviewers extracted means (final scores or change score), standard deviations, and sample sizes from studies using a standardised data extraction form. When there was insufficient information in trial reports, we contacted authors or estimated data using methods recommended in the Cochrane Handbook for Systematic Reviews of Interventions.17 Briefly, when the mean was not reported we used the median; when standard deviations could not be estimated, we adopted the standard deviation from the most similar study. Very low quality—we are uncertain about the estimate; three of the domains were not fulfilled. A GRADE profile was completed for each pooled estimate and for single trials comparing drugs versus placebo. Outcome data were extracted for immediate term (two or fewer weeks after randomisation), short term (more than two weeks but less than three months), intermediate term (more than three months but less than12 months), and long term (12 months or more) follow-up evaluations. When multiple time points fell within the same category, we used the one closest to one week for the immediate term, eight weeks for the short term, six months for the intermediate term, and 12 months for the long term. Scores for pain intensity and disability were converted to a scale from 0 to 100. When more than one outcome measure was used to assess intensity of pain, disability, or work status, we included the outcome measure described as the primary outcome measure for the trial. Descriptive statistics were used to describe adverse events reported in each trial. Trials that we considered clinically homogeneous were grouped according to class of drugs, comparison group, dose, outcomes (pain, disability, etc), and outcome assessment time points (immediate term, short term, intermediate term, and long term). Pooled estimates were obtained with Comprehensive Meta-Analysis software, version 2.2.04 (Biostat, Englewood, NJ). Pooled effects were calculated with a random effects model. For calculation of effect size (see appendix tables A and B on bmj.com), we pooled leg pain and overall pain, as leg pain is usually worse than pain in the back. When trials were not sufficiently homogeneous, pooling of data via meta-analysis was not performed and outcome measures of the individual studies were reported. We decided a priori that a sensitivity analysis would be conducted to investigate definitions of sciatica as possible sources of heterogeneity in effect size among included studies. The limited number of trials in the meta-analysis, however, prevented further investigation. The included trials investigated six different classes of drugs: NSAIDs, antidepressants, corticosteroids, opioid analgesics, muscle relaxants, and anticonvulsants. The drugs investigated in the included trials were administered orally in 16 trials21 22 23 24 27 28 32 33 35 36 37 38 41 42 43 and parenterally in five trials (four trials25 30 39 40 investigated intramuscular injections and one trial29 investigated intravenous infusions). Three other trials26 31 34 used mixed administration of a starting intramuscular dose and subsequent oral doses. One study compared oral versus parenteral administration.22 Table 2⇓ shows the characteristics of the included trials, and table 3⇓presents details of methodological quality. Fifteen randomised clinical trials compared drugs with placebo with individual effect sizes calculated for nine trials (fig 2⇓). For five trials investigating NSAIDs,31 corticosteroids,32 34 antidepressants,21 and muscle relaxants,24 we did not calculate effect sizes as percentage of improved patients was reported as an outcome. Four trials compared orally administered NSAIDs with placebo for acute sciatica.28 33 42 Of these, three trials used a three arm design.28 33 Treatment effects for these studies are presented in figure 2⇑. Data for pooling were available from all three studies. Figure 3⇓ shows small and non-significant pooled effect size for pain (overall and leg pain) in the immediate term follow-up (mean difference −4.9, 95% confidence interval −10.2 to 0.4; P<0.07). Because of the three arm design, we calculated effect sizes for three other treatment comparisons (comparison 2 (meloxicam 7.5 mg/day, lornoxicam 8 mg/day, piroxicam 20 mg/day v placebo): mean difference −4.4, −8.9 to 0.1, I2=0.1%, P<0.06; comparison 3 (meloxicam 15 mg/day, lornoxicam 8 mg/day, piroxicam 2 mg/day v placebo): mean difference −3.9, −8.0 to 0.2, I2=0.6%, P<0.07; comparison 4 (meloxicam 15 mg/day, diclofenac 50-150 mg/day, piroxicam 20 mg/day v placebo): mean difference −4.4, −9.4 to 0.6, I2=6.8%, P<0.09) (not shown in fig 3). The quality of evidence (GRADE) for this pooling was rated “low quality” (downgraded for limitation of study design and inconsistency). Three trials in patients with acute sciatica tested the effect of corticosteroids compared with placebo.29 30 35 The individual studies provided imprecise estimates of treatment effect (fig 2⇑). For the immediate term, pooling showed no effect of steroids on leg pain (mean difference −1.8, −11.1 to 7.5; P=0.71) with a GRADE classification of “moderate quality” of evidence (downgraded for imprecision) (fig 3⇑). For the short term, pooling showed a significant effect of steroids on pain (overall and leg pain) (mean difference −12.2, −20.9 to −3.4; P<0.01) and “moderate quality” of evidence according to the GRADE approach (downgraded for imprecision) (fig 3⇑). Three trials investigated the efficacy of antidepressants, anticonvulsants, and opioid analgesics (fig 2⇑).37 38 43 As these were single trials that investigated different classes of drugs or time points of assessment, pooling was not possible. Hence, the quality of evidence for all these medications was considered “low quality” (single studies)37 43 or “very low quality” (single study downgraded for limitation of study design)38 according to the GRADE approach. Two trials investigated the effect of anticonvulsants in patients with chronic symptoms of sciatica. In one crossover trial,38 topiramate (50-400 mg/day) showed no better immediate effects than placebo for disability and leg or back pain. In contrast, data from another trial43 showed significant overall pain relieving effect with the anticonvulsant gabapentin (900-3600 mg) in the short term (mean difference −26.6, −38.3 to −14.9; P<0.001) compared with placebo. One crossover study with four periods investigated the relative efficacy of opioid analgesics (sustained release morphine 15 mg/day), antidepressants (nortriptyline 25 mg/day), and a combination of both and placebo in patients with chronic sciatica.37 In this trial, antidepressants, opioid analgesics, and a combination of both had no significant effect compared with placebo in the immediate term for disability or leg or back pain. Adverse events were investigated in 75% (18/24) of the included trials (table 4⇓); the median number of adverse events (interquartile range) was 17% (10-30%) for the active drugs and 11% (3-23%) for placebo. The rate and type of adverse events reported varied substantially between drugs and between trials for the same medicine. There is at best only low quality evidence to judge the efficacy and tolerability of drugs commonly prescribed for the management of sciatica in primary care. The available evidence does not clearly show favourable effects of NSAIDs, corticosteroids, antidepressants, or opioid analgesics in the immediate term, even compared with placebo. Evidence from a single trial and one meta-analysis with two trials provides some limited support (“low quality” and “moderate quality” evidence) for the use of NSAIDs and corticosteroids to relieve pain in the short term in patients with acute sciatica. In one small sample trial there was also limited support (“low quality” evidence) for the short term relief of pain in chronic sciatica with an anticonvulsant drug. At present these data provide a lack of conclusive and high quality evidence to guide the prescription of these drugs for patients with sciatica in primary care. The strengths of this systematic review include the use of a prespecified protocol, inclusion of trials published in languages other than English, and the use of a highly sensitive search strategy to identify trials for sciatica coupled with search terms related to the nine classes of drugs of interest. We assessed methodological quality with the PEDro scale rather than the Cochrane Risk of Bias tool because the PEDro scale has been shown to have acceptable reliability16 and validity,15 50 whereas two studies have reported reliability limitations with the Cochrane tool.51 52 One limitation of our study is the possibility of publication bias as we did not attempt to identify unpublished trials that could be found in clinical trials registries and conference proceedings. Another limitation is that we could accommodate trials in only four languages other than English. A strength of our review over past reviews is that we located 24 randomised clinical trials relevant to our question compared with six,12 three,46 and two44 45 trials included in the four previous reviews. Accordingly we provide more precise estimates of treatment effects, specifically for NSAIDs and corticosteroids, and a better description about tolerability of all classes of drug. Including more trials has allowed us to provide a more in-depth evaluation of the pharmacological treatments that have been tested for sciatica in primary care. For example, we have provided information on the efficacy of antidepressants and opioid analgesics whereas previous reviews did not cover these classes of drugs. Another strength of this review is that we quantitatively pooled trials where possible. This allowed us to explore the size of the treatment effect, which is not possible in a qualitative summary. In addition, we were able to assess the overall quality of the evidence with the GRADE approach. Although conclusions of previous reviews were based on a surprising paucity of evidence, our findings are likely to inform the direction of future research in this topic. In pharmacological trials for sciatica, we consider the priorities to include consideration of duration of symptoms, recruitment of large samples, and collection of outcomes relevant to patients. For instance, regarding duration of symptoms it would be reasonable to test corticosteroids and NSAIDs in trials in patients with acute sciatica, whereas given that chronic sciatica includes a neuropathic pain component, anticonvulsant and antidepressants might need to be tested in patients with a chronic condition. Although the knowledge of evidence about surgery has changed in the past decade, we still do not know much about a simpler conservative treatment such as pharmacological interventions for sciatica. A recent clinical practice guideline from the American Pain Society53 recommends that surgery should be considered as a treatment option for persistent and disabling radicular pain caused by a herniated lumbar disc. This recommendation relies on moderate short term benefits from large randomised clinical trials such as those by Peul et al54 55 and Weinstein et al,56 with 283 and 501 patients randomised, respectively. At present, there is a limited number of mainly small trials of pharmacological interventions with typically short term follow-up. For example, the evidence to support the use of anticonvulsants in chronic sciatica arises from a single trial with only 50 participants. Contributors: RZP, CGM, BK, PHF, MLF, MH, and AJM were involved in the design of the review. RZP, MLF, PHF, and VCO developed the search strategy and performed the study selection. RZP, MH, AJM, and VCO extracted data from included studies. RZP, CGM, BK, AJM, and VCO were involved in data analysis. RZP, CGM, BK, PHF, MLF, and MH were involved in the interpretation and discussion of results. All authors contributed to the writing and review of the various drafts of the report. RZP and CGM are guarantors. Funding: This research received no specific grant from any funding agency in the public, commercial, or not-for-profit sectors. RZP is supported by Capes Foundation, Ministry of Education of Brazil. CGM is supported by a research fellowship funded by the Australian Research Council. Konstantinou K, Dunn KM. Sciatica: review of epidemiological studies and prevalence estimates. Spine 2008;33:2464-72. Balague F, Nordin M, Sheikhzadeh A, Echegoyen AC, Brisby H, Hoogewoud HM, et al. Recovery of severe sciatica. Spine 1999;24:2516-24. Selim AJ, Ren XS, Fincke G, Deyo RA, Rogers W, Miller D, et al. The importance of radiating leg pain in assessing health outcomes among patients with low back pain. Results from the Veterans’ Health Study. Spine 1998;23:470-4. Tubach F, Beaute J, Leclerc A. Natural history and prognostic indicators of sciatica. J Clin Epidemiol2004;57:174-9. Palmer KT, Griffin MJ, Syddall HE, Pannett B, Cooper C, Coggon D. The relative importance of whole body vibration and occupational lifting as risk factors for low-back pain. Occup Environ Med2003;60:715-21. Younes M, Bejia I, Aguir Z, Letaief M, Hassen-Zrour S, Touzi M, et al. Prevalence and risk factors of disk-related sciatica in an urban population in Tunisia. Joint Bone Spine2006;73:538-42. Vogt MT, Kwoh CK, Cope DK, Osial TA, Culyba M, Starz TW. Analgesic usage for low back pain: impact on health care costs and service use. Spine2005;30:1075-81. Cherkin DC, Wheeler KJ, Barlow W, Deyo RA. Medication use for low back pain in primary care. Spine 1998;23:607-14. Di Iorio D, Henley E, Doughty A. A survey of primary care physician practice patterns and adherence to acute low back problem guidelines. Arch Fam Med2000;9:1015-21. Koes BW, van Tulder M, Lin CW, Macedo LG, McAuley J, Maher C. An updated overview of clinical guidelines for the management of non-specific low back pain in primary care. Eur Spine J2010;19:2075-94. Chou R, Huffman LH. Medications for acute and chronic low back pain: a review of the evidence for an American Pain Society/American College of Physicians clinical practice guideline. Ann Intern Med2007;147:505-14. Furlan AD, Pennick V, Bombardier C, van Tulder M. 2009 updated method guidelines for systematic reviews in the Cochrane Back Review Group. Spine 2009;34:1929-41.
WHO Collaborating Centre for Drugs Statistics Methodology. International language for drug utilisation research. 2011. www.whocc.no/. Macedo LG, Elkins MR, Maher CG, Moseley AM, Herbert RD, Sherrington C. There was evidence of convergent and construct validity of Physiotherapy Evidence Database quality scale for physiotherapy trials. J Clin Epidemiol2010;63:920-5. Higgins JPT, Green S. Cochrane handbook for systematic reviews of interventions, version 5.0.2. Cochrane Collaboration, 2009. Henschke N, Ostelo RW, van Tulder MW, Vlaeyen JW, Morley S, Assendelft WJ, et al. Behavioural treatment for chronic low-back pain. Cochrane Database Syst Rev2010;7:CD002014. Atkinson J, Slater MA, Williams RA, Zisook S, Patterson TL, Grant I, et al. A placebo-controlled randomized clinical trial of nortriptyline for chronic low back pain. Pain1998;76:287-96. Auvinet B, Ziller R, Appelboom T, Velicitat P. Comparison of the onset and intensity of action of intramuscular meloxicam and oral meloxicam in patients with acute sciatica. Clin Ther1995;17:1078-98. Baron R, Freynhagen R, Tolle TR, Cloutier C, Leon T, Murphy TK, et al. 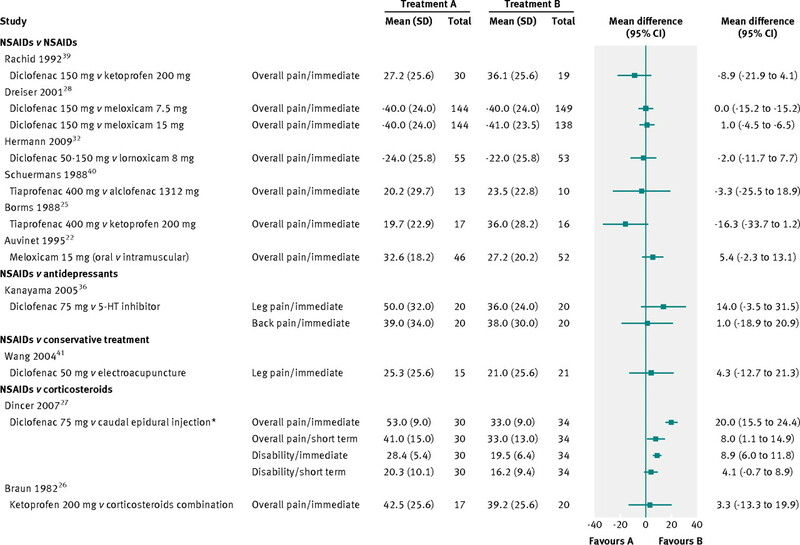 The efficacy and safety of pregabalin in the treatment of neuropathic pain associated with chronic lumbosacral radiculopathy. Pain2010;150:420-7. Berry H, Hutchinson DR. A multicentre placebo-controlled study in general practice to evaluate the efficacy and safety of tizanidine in acute low-back pain. J Int Med Res1988;16:75-82. Borms T. Comparison of injectable formulations of tiaprofenic acid and ketoprofen in acute lumbar sciatica. Single-blind randomised trial. Drugs1988;35:85-7. Braun H, Huberty R. [Therapy of lumbar sciatica. A comparative clinical study of a corticoid-free monosubstance and a corticoid-containing combination drug.] Med Welt1982;33:490-1. Dincer U, Kiralp MZ, Cakar E, Yasar E, Dursan H. Caudal epidural injection versus non-steroidal anti-inflammatory drugs in the treatment of low back pain accompanied with radicular pain. Joint Bone Spine2007;74:467-71. Dreiser RL, Le Parc JM, Velicitat P, Lleu PL. Oral meloxicam is effective in acute sciatica: two randomised, double-blind trials versus placebo or diclofenac. Inflamm Res 2001;50:S17-23. Finckh A, Zufferey P, Schurch MA, Balague F, Waldburger M, So AK. Short-term efficacy of intravenous pulse glucocorticoids in acute discogenic sciatica. A randomized controlled trial. Spine2006;31:377-81. Friedman BW, Esses D, Solorzano C, Choi HK, Cole M, Davitt M, et al. A randomized placebo-controlled trial of single-dose IM corticosteroid for radicular low back pain. Spine 2008;33:e624-9. Grevsten S, Johansson H. Phenylbutazone in treatment of acute lumbago-sciatica. Z Rheumatol1975;34:444-7. Haimovic IC, Beresford HR. Dexamethasone is not superior to placebo for treating lumbosacral radicular pain. Neurology1986;36:1593-4. Herrmann WA, Geertsen MS. Efficacy and safety of lornoxicam compared with placebo and diclofenac in acute sciatica/lumbo-sciatica: an analysis from a randomised, double-blind, multicentre, parallel-group study. Int J Clin Pract2009;63:1613-21. Hofferberth B, Gottschaldt M, Grass H, Buttner K. [The usefulness of dexamethasonephosphate in the conservative treatment of lumbar pain—a double-blind study (author’s translation).] Arch Psychiatr Nervenkr1982;231:359-67. Holve RL, Barkan H. Oral steroids in initial treatment of acute sciatica. J Am Board Fam Med2008;21:469-74. Kanayama M, Hashimoto T, Shigenobu K, Oha F, Yamane S. New treatment of lumbar disc herniation involving 5-hydroxytryptamine2A receptor inhibitor: a randomized controlled trial. J Neurosurg Spine2005;2:441-6. Khoromi S, Cui L, Nackers L, Max MB. 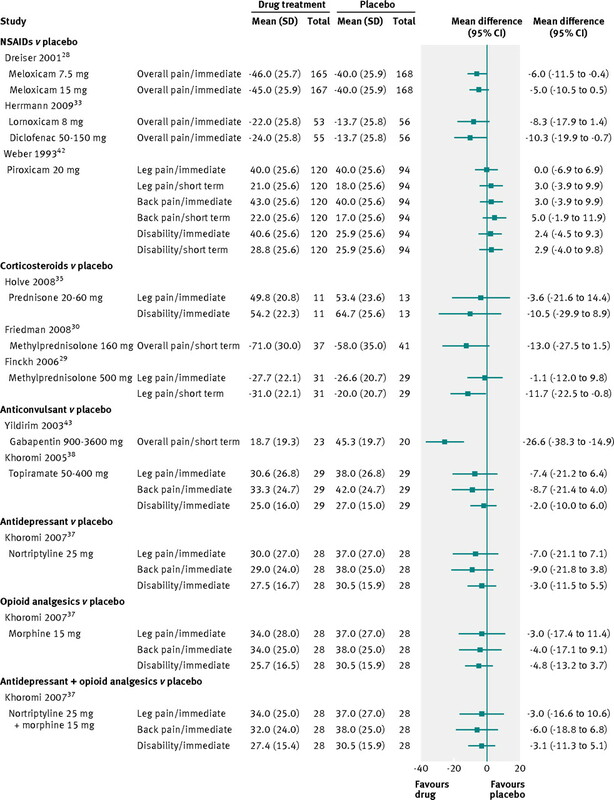 Morphine, nortriptyline and their combination vs placebo in patients with chronic lumbar root pain. Pain2007;130:66-75. Khoromi S, Patsalides A, Parada S, Salehi V, Meegan JM, Max MB. Topiramate in chronic lumbar radicular pain. J Pain2005;6:829-36. Rachid A. Avaliação da eficácia e tolerância do cetoprofeno (200 mg/dia) comparada ao diclofenac sódico (150 mg/dia) no tratamento da lombociatalgia aguda. [Evaluation of efficacy and safety of ketoprofen (200 mg/day) compared to diclofenac (150 mg/day) in the treatment of acute lombociatalgia.] Rev Bras Med1992;49:37-40. Schuermans Y, Rauis A. Comparative clinical trial of two injectable NSAIDs, tiaprofenic acid and alclofenac, in acute sciatica. Drugs1988;35(suppl 1):83-5. Wang BX, La JL. Therapeutic effects of electro-acupuncture and diclofenic on herniation of lumbar intervertebral disc. Zhongguo Linchuang Kangfu2004;8:3413-5. Weber H, Holme I, Amlie E. The natural course of acute sciatica with nerve root symptoms in a double-blind placebo-controlled trial evaluating the effect of piroxicam. Spine1993;18:1433-8. Yildirim K, Sisecioglu M, Karatay S, Erdal A, Levent A, Ugur M, et al. The effectiveness of gabapentin in patients with chronic radiculopathy. Pain Clinic2003;15:213-8. Roelofs PDDM, Deyo RA, Koes BW, Scholten RJPM, van Tulder MW. Non-steroidal anti-inflammatory drugs for low back pain. Cochrane Database Syst Rev2010;1:CD000396. Vroomen PC, de Krom MC, Slofstra PD, Knottnerus JA. Conservative treatment of sciatica: a systematic review. J Spinal Disord2000;13:463-9. Goldie I. A clinical trial with indomethacin (indomee(R)) in low back pain and sciatica. Acta Orthop Scand1968;39:117-28. Radin EL, Bryan RS. Phenylbutazone for prolapsed discs? Lancet1968;2:736. Weber H, Aasand G. The effect of phenylbutazone on patients with acute lumbago-sciatica. A double blind trial. J Oslo City Hosp1980;30:69-72. De Morton NA. The PEDro scale is a valid measure of the methodological quality of clinical trials: a demographic study. Aust J Physiother2009;55:129-33. Armijo-Olivo S, Stiles CR, Hagen NA, Biondo PD, Cummings GG. Assessment of study quality for systematic reviews: a comparison of the Cochrane Collaboration Risk of Bias Tool and the Effective Public Health Practice Project Quality Assessment Tool: methodological research. J Eval Clin Pract2012;18:1218. Hartling L, Ospina M, Liang Y, Dryden DM, Hooton N, Krebs Seida J, et al. Risk of bias versus quality assessment of randomised controlled trials: cross sectional study. BMJ2009;339:b4012. Chou R, Loeser JD, Owens DK, Rosenquist RW, Atlas SJ, Baisden J, et al. Interventional therapies, surgery, and interdisciplinary rehabilitation for low back pain: an evidence-based clinical practice guideline from the American Pain Society. Spine 2009;34:1066-77. Peul WC, van den Hout WB, Brand R, Thomeer RT, Koes BW. Prolonged conservative care versus early surgery in patients with sciatica caused by lumbar disc herniation: two year results of a randomised controlled trial. BMJ2008;336:1355-8. Dworkin RH, O’Connor AB, Audette J, Baron R, Gourlay GK, Haanpaa ML, et al. Recommendations for the pharmacological management of neuropathic pain: an overview and literature update. Mayo Clin Proc2010;85:S3-14. National Institute for Health and Clinical Excellence. Neuropathic pain: the pharmacological management of neuropathic pain in adults in non-specialist settings. Clinical guideline 96. 2011. www.nice.org.uk/CG96. Tan T, Barry P, Reken S, Baker M. Pharmacological management of neuropathic pain in non-specialist settings: summary of NICE guidance. BMJ2010;340:c1079.